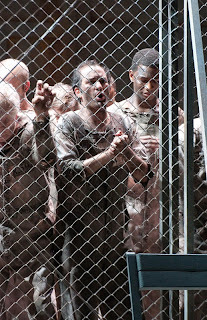 Theo Lebow first sang on the Seattle Opera mainstage in 2012 in a small role in Fidelio. But the young American tenor made a powerful impression in Seattle a few months later, memorably singing a smattering of Verdi—La traviata, Don Carlo, and Rigoletto—at our big “Viva Verdi!” concert in 2013. The native Californian told me the other day about some of the adventures he’s been having since then, and about embodying this wonderful character of Jupiter, king of the gods (photo by Elise Bakketun), in our production of Semele. Last time you sang in Seattle, we heard your Duke of Mantua. What do he and Jupiter have in common? They’re both suave, philandering ladies’ men with power. For the Duke it’s his social status, but Jupiter is divinely powerful; he’s the leader of the gods, the "Mighty Thunderer," the most powerful of them all. The Duke is mortal, whereas Jupiter is divine. How do you go about playing a character who’s not a human being? Honestly, there’s not that much difference...you still play Jupiter as a human being. In those moments that are supernatural, such as when he wields his thunder and lightning—they are merely an extension of his will. That is one of the main differences (that, and immortality) that separates Jupiter from the Duke. The emotions that Jupiter experiences, however, are very, very human: love, passion, compassion, adoration, and on the other hand, fear, pain, remorse, denial and devastation. The big thing that’s missing from Semele is a scene for Jupiter and Juno. What would happen, if Congreve and Handel had written such a scene? Honestly, I think this confrontation probably happened before the beginning of the opera, and it was similar to the Act Two confrontation between Wotan and Fricka in Die Walküre. The punches would be thrown. Juno wouldn’t hold back—she would invoke our marriage and demand that I allow Semele to marry Athamas. The outcome, however, is quite obviously different. Jupiter disobeys and snatches his love away. Juno finds out, and-- "Hence! Iris, hence away!" 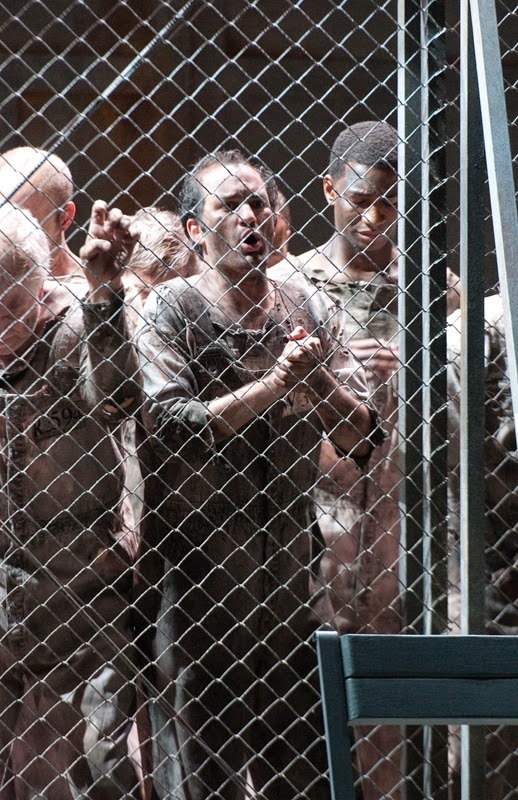 This is your first Handel opera. How are Handel’s works different from others you’ve done? I love singing Handel! There’s so much you can do—with ornamentation and with dynamics. With many other composers, their works have been steeped in tradition, making it very difficult to find an acceptable alternative, and many composers ask for very specific tempo markings and dynamics. While Handel does specify a general tempo, in most cases the dynamics are up to the performer. And since the music often repeats, the options for ornamentation are many. I'm still finding different ways to ornament. It's a very enjoyable discovery process. 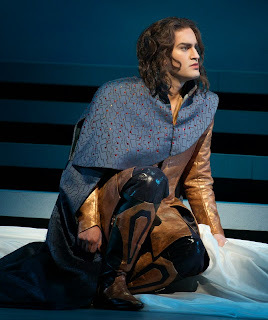 That means that your Jupiter may be quite different from that sung by Alek Shrader, who sings the other performances. Yes, but I love the way he sings the role and I'm learning a lot from him. He sounds amazing. This isn’t the first time you’ve been in a show with Stephanie Blythe. What’s your past history with her? I’ve worked with her a couple of times. In 2011 I had the pleasure of being in the Richard Tucker Gala—I sang Fenton for the big fugue from Falstaff, which ended the concert. So there I was, standing there with Stephanie Blythe on my right and Bryn Terfel on my left! I remember I was afraid to say two words to her. And then last year we worked together again at Opera Theater of St. Louis, for the world premiere of this new piece by Ricky Ian Gordon, 27, libretto by Royce Vavrek, in the style of Gertrude Stein. He wrote the opera for Stephanie, who played Gertrude Stein. It took place in Gertrude Stein’s atelier on 27 Rue de Fleurus in Paris. The cast consisted of five people—Stephanie as Gertrude Stein, Elizabeth Futral as Alice B. Toklas, and three men; myself Tobias Greenhalgh, and Daniel Brevik. Be sure to keep your ears peeled for Toby and Danny; they're both fantastic singers! Our roles changed as the timeline progressed. We started out as painters—I was Pablo Picasso, and the others were Matisse and Gertrude’s brother, Leo. Then, after World War I, we became F. Scott Fitzgerald (me), Hemingway, and Man Ray. And we also played what I liked to call ‘Gertrude and Alice’s mental matter’—we were dressed in wool, something between narrators, mental projections and judges. All sung as a trio. Yes. We also sang as the voices of the paintings she had collected. It was! There’s no greater honor in creating something like that. To support Stephanie Blythe and Elizabeth, to help create something that wonderful, while making my debut on the stage of Opera Theater of St. Louis, one of America's biggest summer festivals, was amazing. Just watching Stephanie and Elizabeth sing, in and of itself, was a major learning experience! As singers, we receive voice lessons, coachings, acting classes, etc., and then you have to bring that all into practice and create something honest. Stephanie and Elizabeth do it so well, it seemed as simple as brushing one's teeth. It was all quite inspiring to watch them throughout the process of putting the opera on it's feet.